Notice: This same mis-conception about Enterprises is what leads people to misconstrue Enterprise Architecture as being big, monolithic, static, inflexible and unachievable ... and it takes too long and costs too much! If you think that this, the Roman Coliseum, is Architecture, I will tell you, it is big, monolithic, static, inflexible and it took a long time and cost a lot of money! How long do you think it took them to build this thing? Not a day! Not a year! Not a decade! ... it took around two decades. And ... the Architecture had to be done long before they ever created the Roman Coliseum. They could not have even ordered up the stones to stack on top of each other until somebody did the Architecture. This is NOT Architecture. This is the RESULT of Architecture ... an implementation, an instance. In the result, you can see the Architect’s Architecture. The result is an INSTANCE of the Architecture. They could have built a hundred of these things ... they only built ONE! Actually, I was in New Zealand doing a seminar a few years ago and I said, “They could have built a hundred of these things ... they only built one” ... and some guy in the back of the room said, “No, no ... they actually build THREE!” THREE?! I didn’t know that! He even knew where they were! I was really impressed! 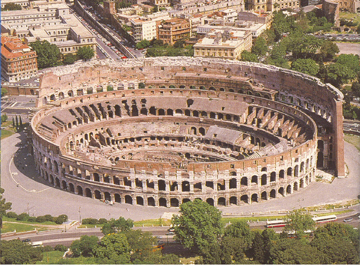 The point is, you can build as many as you like but this, the Roman Coliseum, is not Architecture! This is an INSTANCE of Architecture. Architecture IS a SET ... it is not a single thing ... it is a SET of descriptive representations relevant for describing a complex object (actually, ANY object) such that an instance of the object can be created and such that the descriptive representations serve as a baseline for changing an object instance, that is, as long as the descriptive representations are maintained consistent with the instantiation. If you change the instantiation and do not change the descriptive representations, they will no longer serve as a baseline for ensuing changes.